Two nations finally achieve peace, marked by a momentous royal wedding. But just as they seal it with a kiss, a group of soldiers sabotage the wedding and kidnap the bride! From the creators of the hit game, Skyborn, comes their latest RPG epic: Echoes of Aetheria. Echoes of Aetheria has a humble, perhaps even classic, beginning. A wedding interrupted, a bride kidnapped; our heroes give chase. Though their motives are different, they soon find themselves thrown together as their simple quest to recover the bride spirals into an epic saga of war, love, and betrayal. Characters Make the Story – Echoes of Aetheria is more than just a story; it’s a tale about people. Every character has fully fleshed out dreams, goals, motivations, and flaws. These characters exist in a world with its own legends, intrigue, and drama. In turn, this sets the stage for our story, which begins as a whimsical light-hearted adventure and ends as an epic campaign of unprecedented size and scope. There's No Place Like Home – As you travel around the world, you’ll always have a home base to return to. This home is more than just a place to hang your hat; it’s the hub on which the wheel of the story spins. Shop, craft, and converse with members of your party to progress story elements. Participate in the Battle Arena combat challenges for fun, loot, and xp! Explore Like Magellan – Finding loot from exploration is only one reward; you gain experience from these hidden caches as well. Take the time to explore the world and be rewarded in full! Get Busy Crafting – THOUSANDS of items can be crafted, salvaged, or augmented. A fully integrated crafting system lets you create, purchase, or sell the materials you need. Those who fully explore the system will be rewarded in combat! Random Encounters? Not Here! – Enemies all have their own map AI. Will you brute force through encounters or stealthily sneak by to save resources? You can sneak up behind an enemy to gain the advantage of surprise. But be wary, because they can also sneak up on you! A New Battle System – Tired of JRPGs that still rely on outdated RPG mechanics? 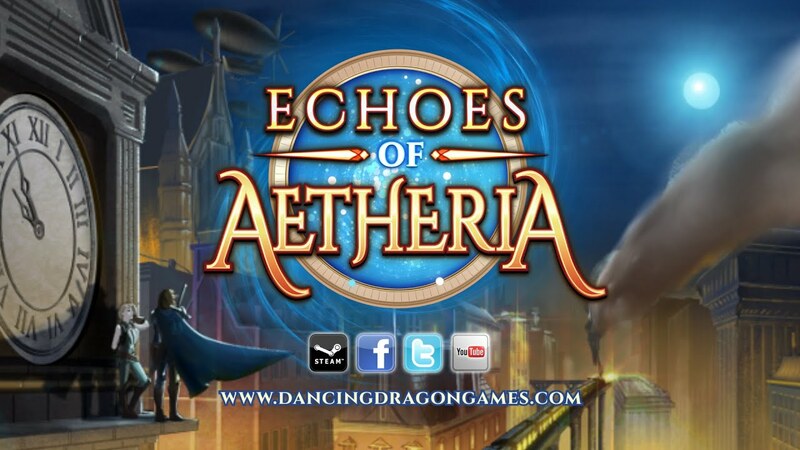 Echoes of Aetheria features a new 15 tile combat system using both sides of the battlefield. Character position and formations are just as important as the skills and spells you’ll use. Sweeping Orchestral Sound – Our epic soundtrack will keep you enjoying every last note.